Subjacent to the Carlile in west-central Kansas is the Pfeifer Shale Member of the Greenhorn Limestone. Typical exposures of the member consist predominantly of yellowish-gray chalky shale that is interbedded with a small volume of yellowish-gray chalky limestone in thin to medium, commonly pinching and swelling beds (Pl. 3B). Layers of oblate-spheroidal chalky limestone nodules are not uncommon in the Pfeifer. Fresh exposures of these strata are generally olive gray to medium gray. Most beds of the member are richly fossiliferous and contain an abundance of Inoceramus labiatus. Plate 3--Topographic expression of Greenhorn, Carlile, and Niobrara Formations. A, Fort Hays escarpment, capped by limestone of Fort Hays and underlain by upper Carlile beds, sec. 29, T. 11 S., R. 16 W., Ellis County (Loc. 25). B, Typical exposures of upper part of Greenhorn Limestone and lower part of Fairport Member, sec. 15, T. 13 S., R. 15 W., Russell County. Note upland surface developed on lower Fairport beds. C, Slump block of limestone (Fort Hays), sec. 4, T. 11 S., R. 18 W., Ellis County (Loc. 18). Note sharp contact of very thick bedded Fort Hays on thinner beds of Codell Sandstone Member. Highest stratum of the Greenhorn is a geographically and lithologically persistent bed of tough chalky limestone that Cragin (1896, p. 49) called the Downs limestone or Fencepost limestone. The informal term "Fencepost limestone bed" has become widely popular through extensive use of the rock for fence posts, attaining stature equal to that of names of adjacent members because the unit is an excellent marker bed. The Fencepost outcrop is marked over broad areas by abandoned shallow quarries from which the rock has been excavated. In Hamilton County, Kansas, the top half of the Greenhorn, equivalent to the Jetmore Chalk and Pfeifer Shale Members of west-central Kansas, was named Bridge Creek Limestone Member by Bass (1926, p. 67). The topmost unit of this member consists of a thicker-than-usual layer of relatively hard chalky limestone that Bass (1926, p. 69) correlates with the Fencepost. Except where erosion has removed younger Cretaceous strata, the Carlile Shale is overlain by the Fort Hays Limestone Member of the Niobrara Chalk. The Fort Hays comprises 45 to 70 feet of yellowish-gray- to grayish-yellow-weathering tough chalky limestone. The rock breaks readily upon weathering and is well jointed, but the member offers much greater resistance to erosion than the underlying shale beds and caps a prominent escarpment at the western edge of the Carlile outcrop. In broad interstream areas, the Fort Hays escarpment is characterized by a gently rounded lip and poor exposure of the limestone. In contrast, the limestone is well exposed and forms cliffs that stand out in bold relief along valley walls of major streams. Along the Saline River valley in northern Ellis County, huge masses of the Fort Hays have become dislodged from the bluffs overlooking the river and many have slumped far downslope (Pl. 3C). Recognition of the Fort Hays Member is not difficult, because topographic expression and general appearance of exposures suffice for identification in most areas. Innumerable small fragments of the weathered rock impart a whitish tinge to slopes in places where Fort Hays bedrock is not exposed; furthermore, color of unimproved roadways changes from drab brown to pale shades of yellow near the Carlile-Niobrara contact. Stratigraphic relations of this contact are discussed below. Like most units in the Colorado Group, the Fort Hays Limestone is of remarkably uniform lithologic and paleontologic character throughout the area of the Fort Hays escarpment. A large and easily identified pelecypod, Inoceramus deformis, is ubiquitous in the Fort Hays Limestone and serves to identify the member wherever the unit crops out. As early as 1857, Hayden depicted Cretaceous rocks of Kansas on colored geological maps of fairly large scale. First to present a complete classification of Cretaceous strata in the Western Interior, however, were Hall and Meek (1856, p. 405), who subdivided the Missouri River section of Nebraska into units numbered one through five, from the base upward. Geographic names based on places of typical exposure of these subdivisions were subsequently published by Meek and Hayden (1861, p. 419) in a comprehensive tabulation that included lithologic and paleontologic descriptions and thicknesses for each of the five formations. The name "Fort Benton Group" was introduced for their original "Formation No. 2," and this embraces strata now called Graneros, Greenhorn, and Carlile. In the same paper (1861, p. 421), they noted the existence of the Fort Benton in "northeastern" Kansas. In 1876, Hayden (p. 45) introduced the name "Colorado Group" for units 2 (Fort Benton), 3 (Niobrara), and 4 (Fort Pierre) of his Nebraska section. The group was restricted by White (1878, p. 21) to units 2 and 3 and has remained thus defined to the present. The term "Benton" has not been applied for many years in areas where the section is subdivided into formations, but its use has been continued informally for several decades by many geologists. In Kansas, "Benton Group" had formal status at least until 1920 (Moore, p. 83). The name Benton Shale or Benton Formation is in use today in parts of Colorado and Wyoming where the Graneros, Greenhorn, and Carlile formations cannot be differentiated. 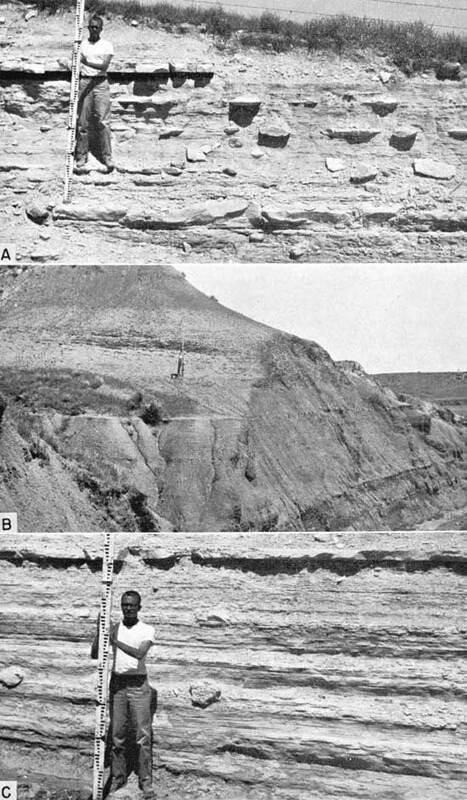 Benton strata in Kansas were first subdivided by Cragin (1896, p. 49), who assigned rocks equivalent to the Graneros, Greenhorn, and Fairport to his "Russell Formation," and those equivalent to the Blue Hill Member to his "Victoria clays". A contrasting subdivision of the Benton Group, into a lower limestone group and an upper shale group, was made by Logan (1897, p. 215). Logan's lower limestone group included the Graneros Shale and Greenhorn Limestone of modern classification, and his upper shale group included the lower two-thirds of what is now known as the Carlile Shale. Logan (1897, p. 217) divided his upper shale group into two "horizons", the lower Ostrea shales, named for the abundance of Ostrea congesta, and the younger Blue Hill shales. That the Fairport Chalk Member be elevated to formational status and bear the name "Fairport Formation." That the Blue Hill Shale Member be redefined to include all beds between the Fairport and the Niobrara (Blue Hill of original usage), be elevated to formational status, and bear the name "Blue Hill Shale." That the Codell Sandstone Member be retained as a member of the Blue Hill Shale. That a new name, "Saline Valley Shale Member," be applied to the lower, or shale and concretion division, of the Blue Hill Shale, and locality 25, where the member is typically developed and completely exposed, be designated as type section. That the Carlile be elevated to subgroup rank in Kansas. Subgroup, rather than group, is suggested in order that the widely accepted concept of the Colorado Group can be preserved. As thus reclassified, the Blue Hill and Fairport conform to every requisite for definition of a formation, as prescribed by Ashley and others (1933, p. 430), Gray (1958, p. 451), and American Commission on Stratigraphic Nomenclature (1961, p. 650). Each of the two formations thus defined is lithologically (and faunally) distinct, geographically widespread, of practical thickness, and mappable on an even smaller scale than that adopted recently as standard by the U. S. Geological Survey (see maps by Rubey and Bass, 1925; Bass, 1926; and Landes, 1930). The contact between the Fairport and Blue Hill is detected readily in the field. Rocks below the contact are chiefly olive-gray, chalky, fossiliferous shale, whereas rocks above the contact are predominantly medium-dark-gray to dark-gray, noncalcareous, poorly fossiliferous, concretionary, flaky-weathering clayey shale. The color contrast, lithologic differences, and faunal differences are pronounced in every section where this contact is exposed. Locally in the subsurface of western Kansas, dark-gray noncalcareous clayey shale a few feet thick lies between the Codell Sandstone Member and the Niobrara Chalk. Because the shale lies between Fairport and Fort Hays beds, it can be included within the Blue Hill, as originally defined by Logan (1897), and may be classed as an unnamed member wherever encountered. It is not suggested that this revision of classification should be extended outside of Kansas nor need it ever be so extended. As stated by the American Commission on Stratigraphic Nomenclature (1961, p. 654), "change in rank of a rock-stratigraphic unit does not require redefinition of its boundaries or alteration of the geographic part of its name. . . The Conasauga Shale is recognized as a formation in Georgia and as a group in eastern Tennessee." Thus, the Fairport and Blue Hill may be classed legitimately as members of the Carlile in one area, and as formations in another. The Carlile is recognized as a discrete lithostratigraphic unit in all of southeastern Colorado and as far southwestward as the Las Vegas, New Mexico, area (Griggs and Hendrickson, 1951, p. 31) (Fig. 2). According to Rankin (1944, p. 9), the Greenhorn can be traced as far southwestward as Benson, Cochise County, Arizona. In the same paper, Rankin (p. 12) states that the Fort Hays Limestone Member can be traced with certainty westward to Pagosa Springs, in south-central Colorado. The basis for recognition of the Carlile-Niobrara contact in northern New Mexico is change from sandy noncalcareous shale to less sandy, very calcareous shale. The boundary between the Niobrara and Carlile cannot be demonstrated adequately west of a line running from Las Vegas, New Mexico, to Pagosa Springs, Colorado, and use of the term Carlile west of that line seems to be unwarranted. Along the Rocky Mountain Front in Colorado, the term "Benton Formation" is used, where the Greenhorn Limestone is not present, to embrace Graneros, Greenhorn, and Carlile equivalents. In the Golden Quadrangle, Colorado, the lower part of the Colorado Group is referred to as the Benton by Van Horn (1957), even though the Carlile equivalent is recognized clearly; in South Park, Colorado, Stark and others (1949, p. 52) do not subdivide the Benton. The Benton Group is subdivided south of Castle Rock, Colorado, where the Greenhorn Limestone appears within the Benton section (Lovering and Goddard, 1950, p. 39). The Carlile also is recognized in the subsurface in most of the Denver Basin of eastern Colorado, but where the Greenhorn is poorly developed, as in southeastern Wyoming (McCrae, 1956, p. 89), the term "Benton" is in general use. The term "Carlile" has been used extensively for noncalcareous clayey shale lying between the Frontier Formation and Niobrara Chalk in the area from the Laramie Basin, Wyoming, to the west flank of the Powder River Basin, Wyoming. Because these strata represent only the uppermost, or Sage Breaks, division of the Black Hills Carlile, the name "Sage Breaks Shale" is preferable in these places, according to Faulkner (1956, p. 41) and Berg (1956, p. 82). Fig. 2--Map showing areal distribution of Carlile Shale and nomenclature of contiguous strata. Northward from Kansas the Carlile Shale is known in Nebraska and South Dakota, where it is well developed in both surface and subsurface sections (Condra and Reed, 1959; Barkley, 1952, 1953; Baker, 1.948, 1951), and it is exposed in a small area of northwesternmost Iowa, according to Todd (1908, p. 2). The thickest and most fossiliferous section of the Carlile Shale is exposed along the north flank of the Black Hills (Cobban, 1951; personal communication, 1959). Gries (1954, p. 449) recognized the Carlile Shale throughout the Williston Basin subsurface in North Dakota and easternmost Montana. Equivalent strata crop out only along Pembina and Little Pembina Rivers in northeasternmost North Dakota and have been referred to the Benton Group by Kline (1942, p. 351). Kline noted that the Benton there includes three distinct lithologic subdivisions, suggesting possible correlation with the Graneros, Greenhorn, and Carlile. Cobban and Reeside (1952, pl. 1) classified the Pembina section according to the nomenclature of Wickenden (1945) in Canada. Nomenclature of rock units laterally adjacent to the Carlile Shale is shown in Figure 2. Toward the south, the Carlile was contiguous with part of the Eagle Ford Formation of Texas and southeastern New Mexico before erosion removed most Cretaceous rocks from the intervening area. Where the Carlile-Niobrara contact loses distinction westward across northern New Mexico, the Carlile Shale loses its identity in a thick section of the Mancos Shale. From Castle Rock, Colorado, to southeastern Wyoming, as noted above, the Carlile passes into the Benton Formation westward from the Rocky Mountain foothills. Still farther westward in Colorado, the Benton merges with part of the Mancos Shale. In southern and east-central Wyoming, the Carlile grades westward into sandy beds of the Frontier Formation, but farther north, along the west flank of the Powder River Basin, Carlile lithology can be detected in the lower part of the Cody Shale. Northwestward from the Black Hills, the Carlile loses identity in the thick Colorado Shale sequence, which is recognized as far to the north as south-central Saskatchewan. In southeastern Alberta and southwestern Saskatchewan, Carlile equivalents are classed as part of the Alberta Group. Lithologic characteristics of the Manitoba and southeastern Saskatchewan sections (Wickenden, 1945) suggest that the Carlile passes northward and northeastward from the Williston Basin into the upper part of the Favel Formation and lower part of the Vermilion River Formation of those areas. Name and definition--Rubey and Bass (1925, p. 40) proposed the name "Fairport Chalky Shale Member" for the lower part of the Kansas Carlile in order to replace the nongeographic term "Ostrea shales" of Logan. No type section was selected, but four stratigraphic sections (Rubey and Bass, 1925, p. 44) in an area a short distance south and west of Fairport, Russell County, may be used to define the type area. So far as is known, in no place near the town of Fairport can the entire member be viewed in a single exposure. Beds of chalky shale, calcareous shale, chalky limestone, and impure chalk that lie between the Fencepost limestone, below, and the noncalcareous Blue Hill Member, above, constitute the Fairport Member. Definition of the unit by Rubey and Bass corresponds exactly to that of Logan's Ostrea shales. The Fencepost bed is almost uniformly 0.7 to 0.8 foot thick, and has a nearly central iron-stained layer. Chalky limestones in the uppermost Pfeifer are crowded with molds and shells of characteristic Inoceramus labiatus at most exposures. Specimens of this fossil are less abundant in chalky limestones above the Fencepost bed, and those in lower Fairport beds mostly represent a broader variety of the species. Chalky limestone layers are spaced closely in the uppermost Greenhorn. The lower 5 feet of Fairport lacks continuous layers of chalk at most exposures. Nearly everywhere, the lower 5 feet of Fairport has three, or locally four, layers of widely spaced, fairly large chalky limestone nodules 0.2 to 0.3 foot thick (Pl. 4A). A 0.2- to 0.3-foot layer of nearly white bentonite that weathers dark yellowish orange everywhere lies approximately 5 feet, locally as little as 3.8 feet, above the Fencepost bed (Pl. 4A). In Hamilton County, as in west-central Kansas, the uppermost Greenhorn beds are crowded with typical specimens of Inoceramus labiatus, and a relatively greater volume of chalky limestone occurs below the Fencepost bed than in an equivalent thickness above. Seemingly, bentonite is lacking in the lower 30 feet of the Fairport, and recognition of the Greenhorn-Carlile boundary is somewhat more difficult in westernmost Kansas. Beds below the contact usually react to dilute hydrochloric acid, whereas beds above do not. In most localities the change is abrupt, but no evidence of physical discontinuity is seen in the section. Locally, the change is gradational through a foot or so of section. Statement by Matsumoto and Miller (1958, p. 352) that the low calcium carbonate content of a single shale sample from Cedar Bluff Dam, Trego County, Kansas, is evidence that the rock is Blue Hill Shale is not necessarily correct. A supporting chemical analysis presented by these authors showed more calcium carbonate than usual for the member because the sample is from an exposure where the Blue Hill Member contains many calcareous fossils. The Fairport-Blue Hill contact is exposed at locality 17 (inset, Pl. 1) in the Smoky Hill River valley a few miles east of Cedar Bluff Dam. Below the contact one finds an abundance of typical Fairport fossils, including large Collignoniceras woollgari specimens like that figured by Matsumoto and Miller (1958, pl. 44); preservation of the fossils is similiar to that at Cedar Bluff Dam. At locality 17, the uppermost 3 or 4 feet of Fairport is weakly calcareous, as at other localities; some of the most fossiliferous strata, well below the contact, are virtually noncalcareous; the overlying Blue Hill Shale is noncalcareous and contains only a sparse, poorly preserved fauna consisting of fish scales and diminutive molds of Collignoniceras sp. Thus, the Cedar Bluff Dam material came possibly from the upper part of the Fairport rather than from the Blue Hill Member. A marked change of color at the Fairport-Blue Hill contact is visible in both natural exposures and in trenches. Shale below the contact shows various shades of olive gray, whereas that above is dark gray. Weathering produces an even more prominent change of color. Fairport strata weather to shades of yellow or orange, whereas the Blue Hill Member generally weathers medium gray. The Fairport Member has a dull earthy appearance where weathered, whereas the lower part of the Blue Hill Member weathers flaky, and light-reflection from flake-covered slopes imparts a distinctive sheen to the exposures (Pl. 4B). Finally, in most exposures the lower part of the Blue Hill Member is filled with small well-formed crystals of selenite; the Fairport lacks this feature. Throughout Kansas these criteria serve logically and definitively to differentiate the shale members of the Carlile. Plate 4--Exposures of Fairport Member. A, Lower Fairport beds including layers of chalky limestone nodules, bentonite marker bed 1 (reentrant), and chalky limestone marker bed 2 (above bentonite). Rod rests on Fencepost limestone, sec. 4, T. 13 S., R. 15 W., Russell County (Loc. 29). B, Fairport-Blue Hill contact (base of rod), sec. 21, T. 11 S., R. 17 W., Ellis County. Note marly chalk marker bed 13 near top of Fairport. C, Laminated shaly chalk near base of Fairport, sec. 4, T. 13 S., R. 15 W., Russell County (Loc. 29). Note concretionary nodules of chalky limestone near base of exposure and chalky limestone marker bed 3 near top. Lithology--Although the Fairport is mapped and discussed as a unit, its lithology is too diverse to be described adequately under a single rock name. The several genetically related and partly intergrading kinds of rock that make up most of the unit are therefore described separately, although they are not stratigraphically segregated. The minor bentonitic component is also described separately, because the thin layers are stratigraphically significant. Chalky Shale--Predominant lithology of the Fairport Member is represented by chalky shale that has a characteristic speckled appearance, owing to nearly ubiquitous pellets of chalky calcium carbonate. [Note: The term "chalky shale" is preferred to "shaly chalk" because most of the beds are harder, much darker, grittier, and much less pure than true chalk.] Most of the rock is somewhat gritty because of minute particles of calcite and is generally fossiliferous. Nearly all of the speckled shale is hard, tough, irregularly jointed, and blocky, where freshly exposed by deep digging. Where partly weathered, the shale is soft and splits easily into very thin layers along generally uneven bedding planes. Development of minute selenite crystals along bedding planes enhances splitting qualities of the rock. At some localities, notably locality 30, partly weathered chalky shale has a melanterite taste. Layers of chalky shale subjacent to the lowest Fairport bentonite generally are less well jointed than elsewhere in the unit, and tend to break into platy slabs when split along the bedding. At localities 12, 14, 26, and 29, the rock lying between the first and second bentonites is shaly chalk (Pl. 4C), which is less impure than the chalky shale and splits less easily along bedding planes. Beds of shale in the topmost few feet of the Fairport are, gradationally upward, less speckled and less calcareous than the underlying strata. Where fresh, the chalky shale is olive gray (5Y4/1 and 5Y3/2) to dark olive gray (5Y3/1); medium gray, dark gray, and light olive gray prevail locally. Most exposures of fresh rock are along stream banks and draws; colors typical of deeply weathered rock can be seen only toward the top of such exposures. Partly weathered chalky shale is generally light olive gray (5Y6/1), medium light gray, or light gray. For more deeply weathered chalky shales, yellowish gray (5Y8/1) and grayish orange are the most common colors, but dark yellowish orange and very pale orange prevail locally. Fossils in the shale, except for shark teeth, serpulas, and oysters, generally are flattened along the bedding planes. Collignoniceras woollgari, species of Inoceramus, and Ostrea congesta are by far the most abundant forms. The first is generally represented by external molds, and most specimens are smaller than 2 inches in diameter. Inoceramus is represented by generally fragile shells of prismatic calcite or as molds, and the oysters are well preserved as nearly white shells that litter the slopes locally, especially in the middle part of the member (Pl. 5A). In most exposures, teleost scales about an inch in breadth are common and are particularly well preserved in the lower 20 to 25 feet of the member. Barnacles, bryozoans, and worm tubes are common in the middle part of the member. Plate 5--Features of Fairport Member. A, Ostrea-littered slope in lower half of Fairport, sec. 22, T. 19 S., R. 23 W., Ness County (Loc. 10). Largest specimen is about 1 inch long. B, Laminated chalky limestone in lower part of Fairport, sec. 7, T. 23 S., R. 42 W., Hamilton County (Loc. 21). C, Concretionary nodule of chalky limestone in lower part of Fairport, sec. 29, T. 11 S., R. 16 W., Ellis County (Loc. 26). Note manner in which shaly chalk layers bend around nodule. Thin sections of chalky shale specimens representative of the lower, middle, and upper parts of the member (Pl. 6A, C) reveal that the rock matrix is chiefly microcrystalline calcite ooze, microspar, and clay in combined quantities that range from 40 to 75 percent, increasing in abundance upward in the section. Coarser constituents include Inoceramus fragments and isolated prisms, 5 to 15 percent; spar-filled foraminifers, 1 to 15 percent; cryptograined calcite pellets, 10 to 25 percent; and amber-colored organic fragments, 1 to 2 percent. Inoceramus remains are sparse in the purer chalky shale near the base of the member, whereas foraminifers and pellets are most abundant there. Thin sections of chalky shale from the middle part of the Fairport at locality 4 consist dominantly (as much as 75 percent) of Inoceramus fragments of coarse silt and very fine sand size. Other constituents of these unusually gritty shales include the usual microcrystalline calcite, microspar, clay, foraminifers, and cryptograined calcite pellets. Pyrite and limonite are common secondary minerals in chalky shales. Lamination of constituents is consistently more pronounced in chalky shales than in other rocks of the Carlile Shale of Kansas. In addition to thin-section study, several samples of chalky shale were crushed and examined under the binocular microscope. White specks in the rock are mostly oblate-spheroidal pellets of cryptograined calcium carbonate. The pellets lie parallel to bedding planes and commonly show, by great elongation, the effects of compaction in the shale (Pl. 6A, C). All crushed shale samples contain isolated prisms and fragments of Inoceramus, calcareous Foraminifera, and pellets. A few samples contain limonite, pyrite, gypsum, or all three. Fine powder from the crushed shale was examined under very high magnification, and all samples were found to contain coccoliths that range in abundance from sparse to abundant. Cryptograined pellets contain large numbers of coccoliths. The role of coccoliths in the formation of chalky shales and chalky limestones is discussed below. Plate 6--Photomicrographs of Fairport rocks, plane polarized light. A, Chalky shale from lower part of Fairport showing spar-filled Foraminifera. compressed pellets (light gray), and microcrystalline-calcite-ooze matrix (dark), x150 (Loc. 5). B, Chalky limestone from lower part of Fairport showing spar-filled Foraminifera, numerous uncompressed pellets (gray ovoid areas), and matrix of microcrystalline calcite ooze and microspar, x100 (Loc. 27). C, Chalky shale from uppermost Fairport showing compressed pellets (medium-gray bodies), clay and pyrite lentils (black), and matrix of microcrystalline calcite ooze and microspar, x150 (Loc. 9). This plate available in higher quality in an Adobe Acrobat PDF file containing several plates. Insoluble residues from several samples of chalky shale that represent the lower, middle, and upper parts of the Fairport Member range from 15.2 to 50.1 percent of the rocks, the amount increasing upward in the section. The largest residue is from a sample representing the topmost few feet of the Fairport at locality 9, where, as in similar sections, the chalky character diminishes gradually upward toward the top of the member. The sand-size fractions of the residues include such constituents as fine-silt aggregates, pyrite, clay-limonite aggregates, limonite, replacement silica, and organic matter. Fine to very fine quartz sand and coarse silt make up less than 0.1 percent of the sample from locality 9. One sample of shaly chalk (Loc. 26) and two of chalky shale (Loc. 4 and 9) were examined by x-ray for clay-mineral content. In each of the samples, nonclay minerals are far more abundant than clay minerals. The shaly chalk is composed chiefly of calcite, a small quantity of quartz, and virtually no clay minerals. One chalky shale sample (Loc. 9) contains calcite, dolomite, and quartz in nearly equal amounts, and minor quantities of kaolinite, illite, and montmorillonite, in order of decreasing abundance. In the other chalky shale (Loc. 4), calcite is twice as abundant, and the only clay mineral, and that in small quantity, is montmorillonite. Two of the x-rayed samples and an additional one from locality 27 were analyzed chemically. Analyses of samples from localities 26 and 27 are similar because both specimens are from the same depositional unit. This demonstrates the uniform depositional and later history of the unit over a considerable distance. The greater silica and smaller calcite contents of the sample from locality 9 are reflections of the change in environment toward that of Blue Hill deposition; the sample was taken from the topmost few feet of the Fairport Member. Results of analyses are tabulated below. Chalky limestone--In the lower 20 to 25 feet of the Fairport Member, chalky shales are interstratified with thin to, medium beds and layers of nodules of fine-grained chalky limestone (Pl. 4A, C). The limestone is fairly tough but pulverized easily beneath a hammer. Upper and lower surfaces of the chalky limestone beds are generally very even, and the beds range in thickness from 0.15 to 0.6 foot. In a few places, chalky limestone units consist of two or three very thin beds. Locally, chalky limestone is thinly laminated (Pl. 5B). 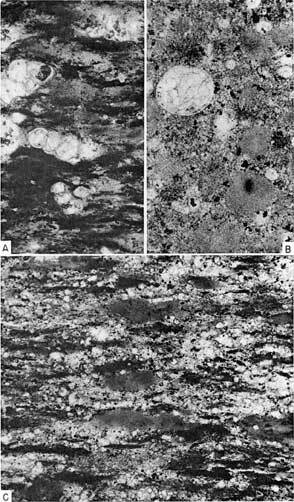 Nodules of chalky limestone are restricted to the part of the section beneath the second bentonite seam of the member, and are most abundant and characteristic beneath the lowest bentonite (Pl. 4A). Chalky shale or, locally, shaly chalk layers commonly are depressed below and arched above the nodules, as at localities 26, 27, and 29 (Pl. 5C). The nodules usually lack stratification, but ferruginous zones pass horizontally through the middle of many. Locally the nodules are as much as 0.5 foot thick and 2 feet in diameter, and at locality 26 a nodule 0.9 foot thick was observed (Pl. 5C). Limestone of the lower part of the Fairport is fine textured and porous but is much more coherent than true chalk; thus the name "chalky limestone" is most appropriate for these rocks. Most of the chalky limestone is somewhat gritty, owing to presence of Foraminifera and Inoceramus prisms, but at locality 21 a bed that lies 15 feet above the base of the member is very gritty, owing to concentration of Foraminifera. Because most outcrops of the lower part of the Fairport Member are along the tops of bluffs that have undergone long weathering, exposures of fresh chalky limestone are uncommon. The fresh rock is olive gray (5Y4/1) or light olive gray (5Y5/2 or 5Y6/1) and characteristically is speckled with white calcareous pellets. Deeply weathered chalky limestone is generally yellowish gray (5Y8/1); dark yellowish orange, yellowish gray (5Y7/2), grayish orange, and very pale orange are the next most common colors, in that order. Rocks that can be termed "partly weathered" show great range in coloration, grayish orange and grayish yellow (5Y8/4) being most common. Several other shades of yellow, gray, orange, and brown prevail at some exposures. In western Russell County, a bed that lies about 19 feet above the base of the member has a conspicuous moderate reddish-orange color and has been called "pink lime" by some geologists (Rubey and Bass, 1925, p. 41). Fossils in the chalky limestone are mostly Collignoniceras woollgari, preserved nearly everywhere as external molds and generally smaller than 3 inches in diameter, a broad variety of Inoceramus labiatus, and I. cuvieri. The last two are unusually well preserved, and structural details of the prismatic layer are readily detectable. Other fossils are like those in adjacent chalky shale but are much less abundant in the chalky limestone. A chalky limestone marker bed (Pl. 4A) that lies 4.0 to 6.2 feet above the base of the formation contains recrystallized remains of belemnites, some of which are more than 0.5 foot in length. Thin-section studies show that the chief constituents of the chalky limestone are microcrystalline calcite ooze and microsparry recrystallized calcite, which make up 45 to 85 percent of the rock (Pl. 6B, 7AD). One sample (Pl. 7A) contains 20 percent of more coarsely recrystallized calcite. Clay in minute streaks is present in a few thin sections. 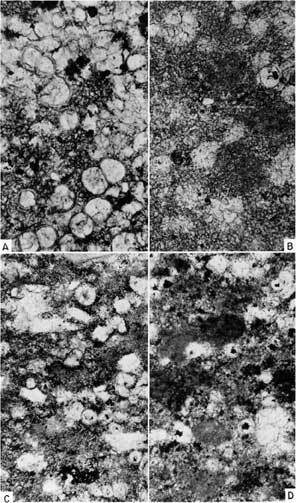 Coarser components include spar-filled calcareous foraminifers, 5 to 30 percent; oblate-spheroidal pellets of cryptograined calcium carbonate that lie parallel to the bedding and are 0.1 to 0.2 mm in maximum dimension, 10 to 40 percent; shell fragments and isolated prisms of Inoceramus, 2 to 10 percent; and amber-colored organic matter, less than 1 percent. Limonite and, in some thin sections, pyrite are common accessory minerals and range from a trace to perhaps as much as 10 percent of the rock. In some thin sections the borders of calcareous pellets are indefinite and irregular where marginal recrystallization has converted the outer part of the pellets to microsparry calcite. Coccoliths were identified in the microcrystalline calcite matrix of a few thin sections. Most of the white specks visible in hand specimens of chalky limestone are soft calcareous pellets of the type described above. Isolated pellets, dispersed in glycerine and viewed at very high magnification, have proved to consist almost entirely of coccoliths, as do pellets from chalky shale. Coccoliths were also identified in each of several bulk rock samples that were crushed, sieved, and examined under high magnification. At locality 3, in the bed that contains recrystallized belemnites, these fossils are sparse, but in the same bed at locality 29 they are more abundant than in any of the other samples. No attempt was made to estimate the total percentage of coccoliths in the crushed rock samples. Frizzell (1933, p. 154) stated that coccoliths make up much of the fine-grained matrix of North American Cretaceous chalk. Bramlette (1958, p. 122), on the other hand, found that in two Upper Cretaceous chalks, one from the Danish Maastrichtian, the other from the Campanian of Texas, only about one-fifth of the rock consists of coccoliths. Bramlette (p. 123) suggested that the smaller percentage of coccoliths and large percentage of small calcite particles in English and German chalk samples may be attributed to recrystallization of the coccoliths. Plate 7--Photomicrographs of chalky limestone from Fairport Member, plane polarized light. A, Chalky limestone showing spar-filled Foraminifera, recrystallized matrix of fine and coarse calcite spar, and limonite (black), x100 (Loc. 21). B, Chalky limestone nodule showing recrystallized Foraminifera (light areas), recrystallized pellets (gray ovoid bodies near center), and matrix of microsparry calcite, x150 (NE sec. 24, T. 12 S., R. 16 W., Russell County). C, Chalky limestone nodule showing sparfilled Foraminifera, fragments of Inoceramus, a pellet (center), pyrite (bottom center, black), and matrix of microcrystalline calcite ooze and microspar, x100 (Loc. 33). D, Chalky limestone nodule showing recrystallized spar-filled Foraminifera, pellets (dark ovoid bodies), pyrite (black), and matrix of microcrystalline calcite ooze and microspar, x100 (Loc. 5). This plate available in higher quality in an Adobe Acrobat PDF file containing several plates. 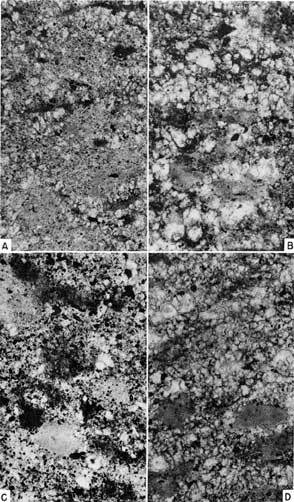 Total insoluble residues in samples of chalky limestone range from 3.8 to 13.1 percent but only 0.31 percent or less of any sample is sand-size residue. Very fine silt and clay aggregates, clay pellets, limonite, or gypsum overwhelmingly dominate the sand-size residues, each of the first three being as much as 95 percent of some residues. Clay pellets in one sample resemble internal molds of Foraminifera. Other residue constituents, all in quantities less than 1 percent, are pyrite, quartz, asphaltic residue, muscovite, agglutinated Foraminifera?, and replacement silica. Residues differ greatly from one another, depending upon stratigraphic position and degree of weathering. Chemical analyses of three chalky limestone samples show somewhat greater CaO content than any other Fairport specimens. The percentage of CaCO3 in these three samples ranges from about 85 to 95 percent. The total possible organic matter is very small; thus, the gray color of the fresh rock can be only partly explained by the presence of finely divided organic matter. Clay and pyrite probably contribute to the rock color. Sample 3-J is a lighter-colored rock than the other two samples, owing chiefly to weathering, has the smallest possible organic content, and has the smallest alumina and sulfur content of the three. This tends to support the contention that organic matter, clay, and pyrite are chief sources of the color of the darker-gray chalky limestone. Marly chalk--Interbedded with chalky shale in the upper 75 feet of the Fairport Member in west-central Kansas are harder beds of generally impure, white-speckled, blocky limestone that are classed here as marly chalk (Pl. 10A). Too little clay is present for these rocks to be classed as marls. Some beds contain such an abundance of fine fossil debris that they are classed properly as silty chalks, and in the field such rocks easily could be misidentified as chalky siltstones. In fresh and weathered exposures, the marly chalks stand out as more resistant lithologic units and many, as indicated below, can be utilized as marker beds. The rock is ordinarily tough where fresh but soft and crumbly where weathered. Beds of chalk are 0.1 to 1.1 feet in thickness. Within the chalky shale at the base of section 17 is some marly chalk that is thoroughly permeated by pyrite, the presence of which results in a much harder rock than is usual for marly chalk. Fossils in the pyritized chalk are replaced by very finely crystalline pyrite. Beds of marly chalk at localities 19, 36, and 37 contain marcasite nodules, which are badly decomposed at the last two localities. Fresh marly chalks are nearly everywhere olive gray (5Y4/1 or 5Y3/1). Partly weathered rock of this lithology is generally light olive gray (5Y6/1), commonly medium to very light gray, and, less commonly, medium to dark yellowish brown. The deeply weathered rock is mostly grayish orange, medium to dark yellowish orange, or yellowish gray, in that order of importance. Fossils in the marly chalks are the same species that are found in the chalky shales. Most abundant are Inoceramus latus and I. cuvieri. In the latter, the calcareous shell is well preserved, but some valves are contorted or fractured, owing to compaction. I. latus is represented commonly by somewhat flattened shells retaining the prismatic layer only, but in the highest marly chalk of the member the species is usually preserved as molds of uncrushed shells. Other common fossils in the marly chalks are Ostrea congesta and Collignoniceras woollgari. Fossils are commonly more abundant in marly chalks than in adjacent chalky shales. 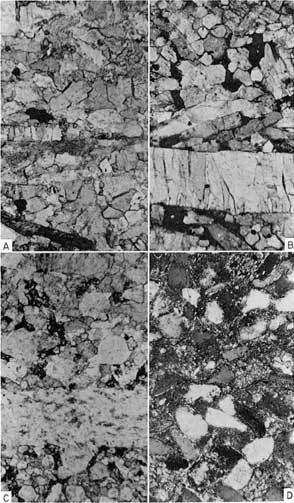 Thin sections of marly chalk have almost uniform composition, varying mostly in percentages of the several components (Pl. 8). The dominant constituents are microsparry calcite or, less commonly, microcrystalline calcite ooze, which make up 45 to 70 percent of the rock. A cryptograined portion of the matrix, consisting of clay-size particles, makes up 5 to 15 percent of the thin sections. Coarser constituents include isolated prisms and fragments of Inoceramus, 5 to 10 percent; calcite-spar-filled calcareous foraminifers, about 5 percent, except in one sample that is 20 percent spar-filled foraminifers; and amber-colored organic matter, less than 1 percent. Oblate-spheroidal pellets of cryptograined calcium carbonate are common, as in other chalky rocks of the Fairport Member, and make up 10 to 25 percent of the thin sections. As in the chalky limestone, many pellets have ragged edges where recrystallized to microsparry calcite. Disaggregated pellets from some samples were examined under very high magnification and found to consist chiefly of coccoliths. These minute fossils can be seen also in the microsparry calcite matrix of some thin sections but in smaller numbers than in the pellets. The white speckling that is characteristic of the marly chalk is attributable to large numbers of calcareous pellets in the rock. At locality 17, marly chalk at the base of the section has been extensively recrystallized and pyritized, as noted above. A thin section of this rock consists of nearly 50 percent very finely crystalline to microcrystalline pyrite and nearly 50 percent sparry calcite, which is in optical continuity throughout large areas of the thin section. Shell fragments, organic matter, and gypsum make up the rest of this recrystallized rock. A thin marly chalk bed in the lower part of the section at locality 19 contains about 15 percent coarse-silt-size angular shards of quartz and feldspar, quite unlike any other rock in the Fairport Member. Both the shape of the shards and the fact that the chalk rests on a bentonite suggest a volcanic origin for the quartz and feldspar. Plate 8--Photomicrographs of marly chalk from Fairport Member, plane polarized light. A, Marly chalk showing pellets (finest-grained ovoid areas near base of photo), limonite (dark areas), and matrix of microsparry calcite, x150 (Loc. 16). B, Marly chalk showing spar-filled foraminifer (lower left), pellets (light-gray ovoid bodies near center), clay (dark-gray interstitial matter), pyrite (black), and matrix of microsparry calcite, x150 (Loc. 16). C, Marly chalk showing pellets (light-gray ovoid bodies), clay (dark-gray blotches), fossil fragments (clear), pyrite (black), and matrix of microcrystalline calcite ooze, x150 (Loc. 17). D, Marly chalk showing spar-filled foraminifer (upper left), pellets (dark-gray ovoid bodies), and matrix of microsparry calcite, x150 (Loc. 17). This plate available in higher quality in an Adobe Acrobat PDF file containing several plates. Total insoluble residues of samples of marly chalk range from 9.4 to 21.5 percent. The largest percentage is in a sample from the highest bed of marly chalk in the Fairport. Sand-size residues constitute 0.11 to 1.64 percent of the rock, although particles of true sand size are very rare in the marly chalk. Sand-size residues are mostly about 99 percent quartz-silt aggregates, but one sample contains 50 percent quartz-silt aggregate, 30 percent bentonite-like clay aggregates that are seemingly pyrimoldic, and 20 percent pyrite. Organic matter and limonite are minor accessories, and one residue contains beekite. Two marly chalk samples, one from the middle of the member and one from near the top, were analyzed chemically. Results of analyses are tabulated below. The larger quantity of silica and smaller amount of CaO in sample 17-B reflect changing environmental conditions near the top of the Fairport Member. The sulfur in 16-J is from pyrite, which was noted also in an insoluble residue from the same bed. The sulfur in 17-B is probably in gypsum, because this mineral is very common in the lower part of section 17. Calcarenite--Scattered at random through the middle and upper parts of the Fairport Member, from 17 feet above the base to the top, are thin to very thin discontinuous layers of hard calcarenite composed chiefly of prisms and fragments of Inoceramus (Pl. 10B). Fragments of Ostrea, disassociated and broken plates of barnacles, and molds of immature Collignoniceras are common rudaceous constituents of these rocks (Pl. 10C). Locally, the shell debris provided a substratum for the growth of Ostrea. 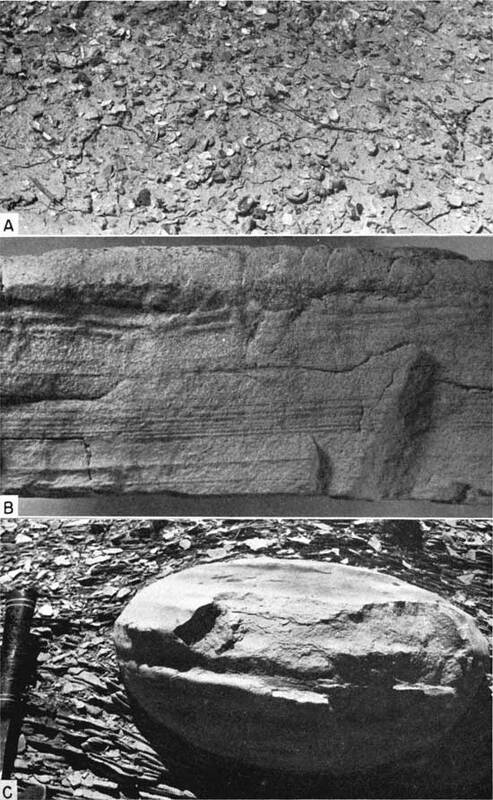 Because Inoceramus fragments so dominate the rock, the informal term "inoceramite" is suggested for this rock type and used in the same manner as Kansas geologists employ "osagite" for Pennsylvanian limestone composed chiefly of the presumed alga Osagia. Most of the inoceramites are grayish orange. Several thin sections of this rock were examined, two of which are illustrated (Pl. 9A, B). Coarser grains in the rock are dominantly pieces of Inoceramus, as fragments, many of which show both nacreous and prismatic layers, and as isolated prisms. Small pieces of amber-colored organic matter, possibly fish scales, are common in two sections. Larger grains are generally well oriented parallel to the bedding. In most thin sections sparry calcite cement occupies the interstices locally (Pl. 9B). Such calcite is commonly in optical continuity through much of a thin section. Some sections have a sparse matrix of microcrystalline ooze. Locally, inoceramite beds are extensively recrystallized, and much of the distinction between clasts and ooze or cement is lost. Orange coloration of most inoceramite layers is attributable to limonite scattered throughout the rock. Plate 9--Arenites from Carlile Shale, under crossed Nicols. A, Calcarenite from middle part of Fairport showing fragments and isolated prisms of Inoceramus, limonite (black), and coarse spar cement, x60 (Loc. 4). B, Calcarenite from upper part of Fairport showing fragments and isolated prisms of Inoceramus, and spar calcite cement that is uniformly at extinction position (black), x60 (Loc. 25). C, Calcarenite from topmost Codell showing recrystallized fragment and numerous prisms of Inoceramus, quartz (large rounded grain, right center), limonite (black), and spar calcite cement, x60 (Loc. 22). D, Siltstone from upper part of Codell at type locality showing dominance of quartz and chert grains, accessory biotite (elongate black grains, lower right and upper right), and matrix of fine silt and clay, x100 (Loc. 28). This plate available in higher quality in an Adobe Acrobat PDF file containing several plates. Plate 10--Lithology of middle part of Fairport. A, Exposure of chalky shale, sec. 2, T. 2 S., R. 5 W., Republic Cotmty (Loc. 41). Note bed of marly chalk above man's head. B, Biofragmental calcarenite, sec. 6, T. 22 S., R. 24 W., Hodgeman County (Loc. 4). Note fragments of Inoceramus and Ostrea. C, Biofragmental calcarenite, same locality. Note disarticulated barnacle plates. Bentonite--Bentonite beds make up a minor but stratigraphically significant part of the Fairport Member (Pl. 4A, 11A). The bentonite is nearly white, less commonly yellowish gray (5Y8/1) where fresh, and weathers dark yellowish orange or, in some places, grayish yellow (5Y8/4). Because the bentonite is readily susceptible to iron staining during weathering, the beds can be recognized as yellowish-orange streaks that cross the face of an exposure. The thickest observed bentonite, 0.4 foot, lies about 30 feet above the base of the Fairport Member at locality 21, Hamilton County. In the west-central Kansas area, the lowest bentonite is generally the thickest in the member, ranging from 0.2 to 0.3 foot. Other widespread bentonite seams are as little as 0.01 foot thick. The highest bentonite in the Fairport is generally 0.01 foot thick, nearly white, and harder than other bentonites in the member. Bentonite in the Fairport Member breaks into small chips or flakes upon drying, or when dug from fresh exposures. At several localities, including 34, 37, and 41, nodules of pyrite are associated with some bentonite seams. At many exposures the bentonite contains considerable limonite and finely granular gypsum. Weathering of pyrite has probably produced the limonite by oxidation and the gypsum by weak sulfuric acid reactions with adjacent calcareous strata. At only one exposure (Loc. 37) were fossils found in the bentonite; furthermore, there is no positive evidence that any ash fall killed large numbers of benthonic invertebrates. Plate 11--Features of Fairport Member. A, Typical exposure of middle Fairport beds showing bentonite (reentrant) near base of exposure, sec. 33, T. 16 S., R. 19 W., Rush County (Loc. 11). B, Exposure of lowermost Fairport beds, sec. 29, T. 11 S., R. 16 W., Ellis County (Loc. 26). Note coalesced chalky limestone nodules enclosed in shaly chalk. C, Well-preserved specimen of Inoceramus cuvieri in middle Fairport strata, sec. 21, T. 11 S., R. 17 W., Ellis County (Loc. 19). Quarter-dollar used for scale. Clay minerals predominate in two samples of lower Fairport bentonite from localities 14 and 29. X-ray study shows montmorillonite to be the dominant mineral and kaolinite second in importance but present only in small to moderate amount. A small quantity of illite occurs in the sample from locality 14, and a very minor amount of chlorite in the sample from locality 29. The nonclay minerals in both samples are quartz and feldspar, each in only small quantity. In addition, biotite was detected in the sample from locality 14. The clay mineralogy of the two samples establishes the rocks as true bentonites. The sample from locality 29 was analyzed chemically with the results shown below. The large amounts of silica and alumina reflect the dominance of clay minerals in the sample. Marker beds--Plate 1 shows graphically the almost incredible lateral persistence of nodule layers, bentonite, chalky limestone, and marly chalk beds that occur in the Fairport Member of west-central Kansas. With detailed knowledge of the section, one can use many such units as structural or stratigraphic datum planes, although in small exposures it may be difficult to recognize their exact position in the section without reference to adjacent exposures. Nonetheless, several key beds can be recognized very readily and these are described below. The first four marker beds have been recognized in the area extending from northwestern Hodgeman County (Loc. 5) to southeastern Jewell County (Loc. 42). 1. Bentonite, nearly white and weathering dark yellowish orange. 0.2 to 0.3 foot thick, lies 3.8 to 5.8 feet above the Fencepost bed (Pl. 4A). Underlying chalky shale contains three, uncommonly four, distinctive layers of oblate-spheroidal nodules of chalky limestone that range to 0.5 foot in thickness and 1.0 foot in diameter. Some nodules are interconnected and present a variety of curiously shaped limestone bodies (Pl. 11B). At all measured sections except at localities 14 and 42, the bentonite bed is overlain by about 0.2 foot of coarsely granular gypsum. 2. Chalky limestone, 0.45 to 0.60 foot thick, lies 4.0 to 6.2 feet above the Fencepost bed (Pl. 4A). At localities 14 and 42 the limestone rests on marker bed 1, but elsewhere the limestone lies on the granular gypsum layer. In many sections, the upper 0.1 foot is separated from the main bed by a thin shaly parting. The top of the marker bed contains recrystallized belemnites? at many exposures. This bed is nearly as prominent in west-central Kansas as the Fencepost bed but is especially distinct because of its association with marker bed 1. 3. Chalky limestone, 0.15 to 0.5 foot thick, lies 11.2 to 15.8 feet above the Fencepost bed and is underlain by 6.0 to 9.0 feet of chalky shale or shaly chalk that generally contains one to three layers of oblate-spheroidal nodules of chalky limestone (Pl. 4C). The nodules in the shale range to 0.8 foot thick and 1.5 feet in diameter. A fossil log (Pl. 12F) with Teredo borings was collected from this bed at locality 5. 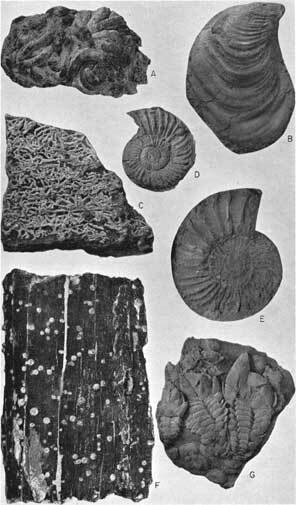 Plate 12--Fairport fossils. A, Conopeum n. sp., encrusted upon Serpula, middle part of Fairport (Loc. 11), x1, KU12053. B, Inoceramus n. sp. ?, internal mold, right valve, upper part of Fairport (Loc. 17), x1, KU12056. C, Proboscina n. sp., encrusted upon fragment of Inoceramus cuvieri, middle part of Fairport (Loc. 53), x2, KU10536. D, E, Collignoniceras woollgari (Mantell). D, Internal mold, juvenile, uppermost Fairport (Loc. 9), x1, hypotype, KU12052A1. E, Internal mold, youthful individual, upper part of Fairport (Loc. 17), x1, hypotype, KU12056A1. F, Calcite-filled Teredo borings in carbonized Cedroxylon sp., lower part of Fairport (Loc. 5), x1/2, KU12051. G, Stramentum? n. sp., attached to fragment of Inoceramus cuvieri, middle part of Fairport (Loc. 34), x1, KU12086. This plate available in higher quality in an Adobe Acrobat PDF file containing several plates. 4. Bentonite, weathered dark yellowish orange, 0.01 to 0.05 foot thick, lies 0.85 to 3.1 feet above marker bed 3. 5. Gritty chalky limestone, 0.35 to 0.7 foot thick, lies 20.4 to 30.2 feet above the Fencepost bed. The interval between the Fencepost and marker bed 5 decreases generally northeastward. Marker bed 5 has been traced from Hodgeman County (Loc. 5) to Osborne County (Loc. 33). A dark-yellowish-orange-weathering bentonite layer, 0.01 foot thick, lies 0.45 to 1.0 foot below the gritty limestone and is an aid to identification of the marker bed. The bed contains fossil wood at locality 27. Chalky shale between marker beds 4 and 5 contains two thin chalky limestone beds at all localities in Ellis and Osborne counties. 6. Three bentonite seams, all weathering dark yellowish orange and separated by chalky shale, lie in a stratigraphic sequence 3.0 to 3.8 feet thick that rests 2.8 to 5.6 feet above marker bed 5 and 24.5 to 36.4 feet above the Fencepost bed. The lowest bentonite ranges from 0.15 to 0.3 foot thick, the second from less than 0.01 to 0.05 foot thick, and the highest from 0.05 to 0.2 foot thick. All three bentonite seams can be traced from Rush County (Loc. 11) to eastern Osborne County (Loc. 33), and they probably extend farther northward, but I have not seen this part of the Fairport in the northern tier of Kansas counties. The lower two bentonite seams are also exposed at locality 5 in northwestern Hodgeman County. The greatest thickness between marker bed 5 and the lowest bentonite of marker unit 6 is at locality 5. Intervals between the first five marker beds are generally greater at locality 5 than elsewhere in west-central Kansas, thus attesting the greater rate of sedimentation here than farther northeast. In the upper 1.5 feet of the chalky shale unit that lies below marker unit 6 is a very thin seam of bentonite, less than 0.005 foot thick, which was seen only at localities 5, 30, and 33. 7. Two nearly white bentonite layers, weathering dark yellowish orange, are the most conspicuous marker beds in the middle part of the Fairport Member and can be traced from northern Rush County (Loc. 11) to eastern Osborne County (Loc. 36 and 37). The lower bentonite seam ranges from 0.05 to 0.07 foot in thickness, the upper from 0.08 to 0.15 foot. They are separated by 0.15 to 0.25 foot of chalky shale, and a silty chalk rests on the upper bentonite layer throughout Ellis County. The lower bentonite bed lies 37.2 feet (Loc. 26) to 44.8 feet (Loc, 36) above the Fencepost bed. Marker unit 7 lies 9.4 (Loc. 26) to 13.5 feet (Loc. 36) above the top bentonite layer of marker unit 6. 8. Gritty marly chalk, 0.5 to 1.1 feet thick and 6.8 (Loc. 26) to 9.4 (Loc. 37) feet above marker unit 7, lies 44.5 to 54.5 feet above the Fencepost bed in the region between northern Rush County (Loc. 11) and western Republic County (Loc. 41). Criteria for recognition of this bed include (a) greater thickness than most marly chalk layers in this part of the Fairport, (b) more gritty character than adjacent marly chalk beds, and (e) a very thin seam of bentonite, 0.01 foot thick or less, that lies 0.3 foot above the chalk in Ellis County, 0.5 foot above in Osborne County, and 1.8 feet above in western Republic County. The bentonite is associated with limonite in Osborne and Republic counties. A thinner, less gritty, marly chalk bed lies 1 to 1.5 feet below the chalk in the northeastern Ellis-western Russell-eastern Osborne County area. 9. Two thin marly chalk beds and an associated very thin bentonite sea-i-n occupy a stratigraphic sequence ranging from 1.1 to 1.7 feet in thickness and lying 51.5 (Loc. 26) to 62.7 feet (Loc. 37) above the Fencepost bed. In parts of northwestern Ellis County and eastern Osborne County, the bentonite is beneath or within the lower marly chalk. At localities 11, 16, and 19, the bentonite lies in chalky shale that separates the two marly chalk beds. Marker unit 9 lies 5.4 to 7.6 feet above marker unit 8 and can be traced definitely from northern Rush County (Loc. 11) to eastern Osborne County (Loc. 37). At locality 41 in Republic County, a bentonite seam that lies 8.2 feet above marker bed 8 is probably the same as that in marker unit 9. At the base of the section at locality 4 in Hodgeman County, a bentonite, chalky shale, and gritty chalk sequence 0.5 foot thick is judged tentatively to be contiguous with marker unit 9. 10. Bentonite, nearly white and weathering dark yellowish orange, 0.06 to 0.16 foot thick, lies 5.7 to 8.1 feet above marker unit 9. The vertical distance of marker bed 10 above the Fencepost bed ranges from 59 (Loc. 25) to 71.2 feet (Loc. 35) in the four composite sections where the interval can be measured. The bentonite can be traced from northwestern Hodgeman County (Loc. 5) to western Republic County. In all measured sections, except that at locality 5, a 0.3- to 0.6-foot marly chalk bed occurs 2.5 to 3.0 feet above the bentonite. 11. Bentonite, nearly white and weathering dark yellowish orange, 0.05 to 0.1 foot thick, lies 7.1 (Loc. 19) to 11.7 feet (Loc. 16) above marker bed 10 and has the same distribution as marker bed 10. In four composite sections where the distance above the Fencepost bed can be determined, marker bed 11 lies between 67.3 (Loc. 19) and 79 feet above the base of the Fairport Member. The bentonite is at a minimum of 19.1 feet below the top of the Fairport (Loc. 38) and a maximum of 41.4 feet below the top (Loc. 16). From northeastern Ellis County to western Republic County a 0.4- to 0.55-foot marly chalk layer rests 0.65 to 0.9 foot above the bentonite. 12. Bentonite, nearly white but locally weathering dark yellowish orange, 0.01 foot thick and harder than most Fairport bentonite, lies 9.2 (Loc. 38) to 28.8 feet (Loc. 16) above marker bed 11, 83.7 (Loc. 19) to 105.2 feet (Loc. 16) above the Fencepost bed, and 6.8 (Loc. 25) to 14.3 feet (Loc. 41) below the Fairport-Blue Hill contact. Marker bed 12 can be traced from southwestern Ellis County to western Republic County and may be represented as far southwestward as locality 9 in Finney County. This bed can be recognized most readily by its association with the next higher marker bed or nearness to the top of the Fairport Member. 13. Marly chalk, 0.4 to 0.8 foot thick and 1.85 to 3.1 feet above marker bed 12, can be traced from southwestern Ellis County to eastern Osborne County, and may be represented by nodular marly chalk at locality 9 in Finney County. The chalk lies 4.4 (Loc. 25) to 8.9 feet (Loc. 17) below the top of the Fairport Member. 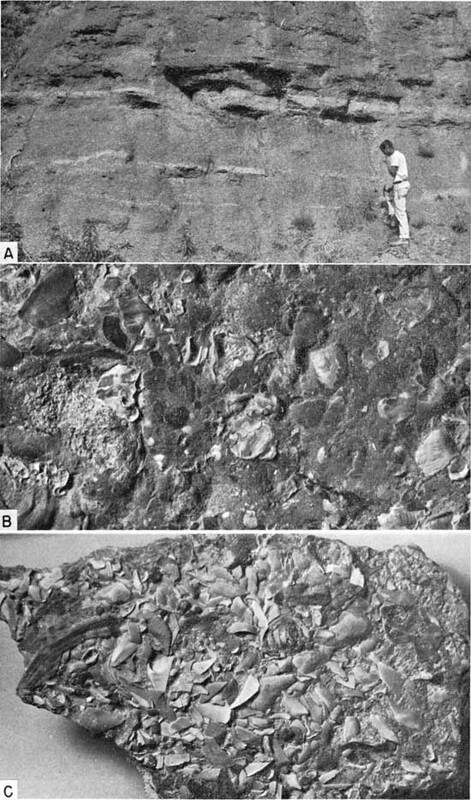 In Ellis County, marker bed 13 contains an abundance of well-preserved molds of Inoceramus. Thickness and distribution--At no single exposure is it possible to measure the total thickness of the Fairport Member. Composite thicknesses have been compiled as follows: (1) Pawnee River valley, Finney and Hodgeman Counties, estimated minimum 121.6 feet; (2) along Smoky Hill River, Ellis County, 117.9 feet; (3) along Saline River, Ellis County, 89.9 feet; and (4) along the Solomon River valley, Osborne County, 98.9 feet. An estimated total of approximately 100 feet along White Rock River in eastern Jewell County and western Republic County is based on comparison of two partial sections with complete sections farther south. Thus, the section is thicker toward the southern end of the west-central Kansas outcrop belt and thinnest in the Saline River valley. In Hamilton County, 147 feet of Fairport was penetrated in a water well, according to Bass (1926, p. 65). In Colorado, the Fairport is recognized as a distinct subdivision of the Carlile from Baca and Prowers counties, in the southeastern corner of the state, to the foothills areas of Fremont and El Paso counties. North of Arkansas River in eastern Colorado, Dane and others (1937, p. 215) reported an estimated 75 to 125 feet of the Fairport Member. Mann (1958, p. 158) reported an average thickness of 70 feet locally in the Canon City Embayment, and Dane and others (1937, p. 215) measured 55 feet of gray limy shale between typical Greenhorn Limestone and Blue Hill strata west of Colorado Springs. The Fairport is not recognized formally along the Front Range north of El Paso County, Colorado. 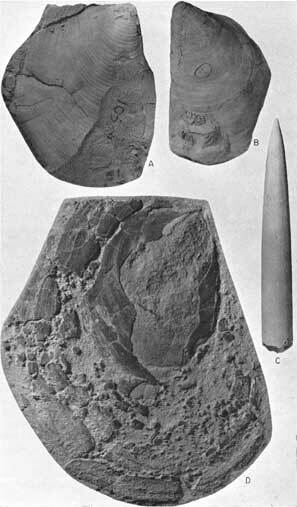 Plate 13--Fairport fossils. A, F, Ostrea congesta Conrad. A, Specimens from middle part of Fairport (Loc. 5), x1/2, hypotypes, KU12051P1. F, Large individuals attached to fragment of Inoceramus cuvieri, middle part of Fairport (Loc. 14), x1, hypotypes, KU12054P1. B, Scaphites patulus Cobban, lower (?) part of Fairport, Horsethief Canyon, Hodgeman County, x1, hypotype, KU11273A1. C, Serpula tenuicarinata Meek and Hayden, encrusted upon fragment of Inoceramus cuvieri, middle part of Fairport (Loc. 57), Russell County, x1, hypotypes, KU12063J1. D, Serpula semicoalita Whiteaves, encrusted upon fragment of Inoceramus cuvieri, middle part of Fairport (Loc. 37), x1/2, hypotypes, KU12062J1. E, Coprolite containing numerous fragments of undigested bone, middle part of Fairport (Loc. 53), x2, KU11279. This plate available in higher quality in an Adobe Acrobat PDF file containing several plates. In Colfax County, northeastern New Mexico, the little-known lower half of the Carlile is a dark-gray shale that is calcareous, at least locally, according to Griggs (1948, p. 28). This is the southwestern limit of known lithologic equivalents of the Fairport Member. Condra and Reed (1959, p. 17) reported a general thickness range of 60 to 80 feet for the Nebraska Fairport. No formal recognition of the Fairport is made in northeastern Nebraska, and calcareous beds are limited to two zones, probably tongues, within the Carlile section (Condra, 1908, p. 12). In addition, beds transitional between Greenhorn Limestone and Carlile Shale are possibly representative of the Fairport in this area. 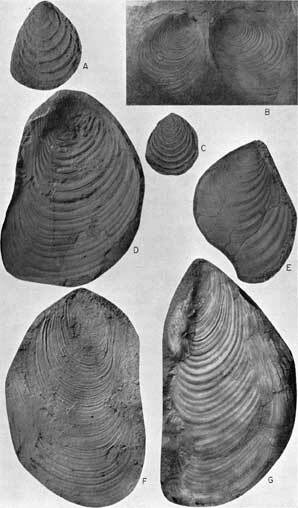 Among common Carlile fossils listed by Condra are Serpula sp., Ostrea congesta, and a large flat species of Inoceramus, all common in the Kansas Fairport. With exception of the Codell Sandstone Member, Carlile strata are not subdivided in the subsurface of most of South Dakota, but in some wells limestone beds like those of the Greenhorn lie above the base of the Carlile, and locally the base of the Carlile is marly (Baker, 1951). The Fairport and Blue Hill are not recognized as formal stratigraphic divisions in the Black Hills of Wyoming, South Dakota, and Montana, but an unnamed shale making up the lower part of the Carlile in this region is divisible into two parts, according to Cobban (1951, p. 2187). The lower unit consists of 13 feet of dark-gray, soft, papery shale that contains thin calcareous shale partings and some lenses of Inoceramus-prism limestone. A concretionary zone marks the top of this unit. The somewhat calcareous nature of this lower shale suggests that it is the northwesternmost lithologic equivalent of the Fairport Member. Little attempt has been made to subdivide the Carlile Shale in the Williston Basin (Gries, 1954, p. 449). At least a part of the Assiniboine Member of the Favel Formation of Manitoba and Saskatchewan is laterally contiguous with lower Carlile strata farther south, but the Assiniboine cannot be distinguished in the subsurface (Wickenden, 1945, p. 23) and bears only superficial resemblance to the Fairport Member. 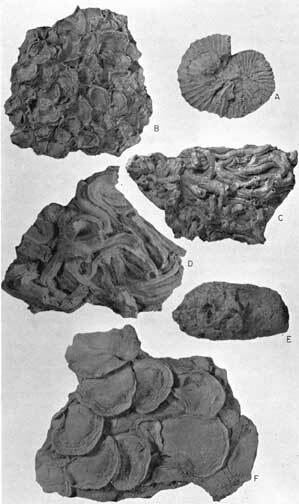 Plate 14--Fairport fossils. A, C, E, Inoceramus latus Sowerby. A, Internal mold, right valve, uppermost Fairport (Loc. 9), x1, hypotype, KU12052P1. C, Internal mold, right valve, middle part of Fairport (Loc. 51), x1, hypotype, KU10546P1. E, Internal mold, right valve, upper part of Fairport (Loc. 16), x1, hypotype, KU12055P1. B, D, F, G, Inoceramus labiatus Schlotheim. B, Form transitional to I. latus, interior of paired valves, lower part of Fairport (Loc. 58), x1/2, hypotype, KU12064P1. D, Broad form, interior of left valve, lower part of Fairport (Loc. 12), x1/2, hypotype, KU10534P1. F, Broad form, interior of right valve, lower part of Fairport (Loc. 5), x1, hypotype, KU12051P2. G, Typical form, interior of left valve, lower part of Fairport (Loc. 33), x1/2, hypotype, KU12061P1. This plate available in higher quality in an Adobe Acrobat PDF file containing several plates. Fossils and correlation--All Fairport exposures contain an abundance of well-preserved fossils, among which mollusks are by far the best represented in numbers of individuals. Fairport fossil localities are less well known than those of the overlying Blue Hill Member, perhaps because the specimens are less spectacular, but more probably because Fairport sections (1) are less numerous, (2) are generally less accessible, (3) expose smaller thicknesses of strata, and (4) are generally more deeply weathered than sections of the Blue Hill Member. Most invertebrate fossils consist of calcium carbonate in which original structure is preserved. The usual color of shell matter is nearly white, but shades of brown and gray are common among specimens of Ostrea congesta and all species of Inoceramus. External molds of I. labiatus and I. latus are common throughout the ranges of these two species in the Fairport, and molds, both external and internal, are the most common mode of preservation of Collignoniceras in the member. Inoceramus and Ostrea, replaced by very finely crystalline. pyrite, were collected at locality 17 and in the SW sec. 11, T. 11 S., R. 17 W., respectively. Three stratigraphically well defined assemblages of invertebrate fossils occur in the Kansas Fairport. The lowest, restricted to the basal 6 to 12 feet, is marked by a broad variety of Inoceramus labiatus. The middle assemblage is characterized by abundance of bryozoans, barnacles, and worm tubes, together with large numbers of I. latus and Ostrea congesta. The highest of the three assemblages is similar to that in the middle beds, but bryozoans, barnacles, and worm tubes are absent or very sparse. Many species range throughout the formation but, although abundant, are not characteristic of any one of the three assemblages. Plate 15--Fairport fossils. A, B, D, Inoceramus cuvieri Sowerby. A, Exterior, right valve, immature specimen, lower part of Fairport (Loc. 12), x1, hypotype, KU10534P2. B, Exterior, left valve, immature specimen, lower part of Fairport (Loc. 12), x1/2, hypotype, KU10534P3. D, Exterior, right valve, nearly mature individual, lower part of Fairport (Loc. 14), x1/2, hypotype, KU12054P2. C, Actinocamax manitobensis (Whiteaves), guard, middle part of Fairport (Loc. 19), x1, hypotype, KU12057L1. This plate available in higher quality in an Adobe Acrobat PDF file containing several plates. Listed below are macrofossils collected during the present investigation. The most abundant and characteristic fossils are preceded by an asterisk. Guide fossils are indicated by a dagger. Rare forms are followed by an asterisk. The ranges are plotted in Table 1, and the more common forms are illustrated in Plates 12 through 15. Collignoniceras woollgari has been selected by Cobban and Reeside (1952, p. 1018) as a zonal index for rocks of Fairport age in the Western Interior region of the United States. The species includes many named varieties but no attempt is made herein to make varietal identifications. Geographically, C. woollgari ranges from Texas, New Mexico and northern Arizona northward to northwestern Montana and southern Alberta, and from Kansas westward to California and Oregon. The stratigraphic distribution includes the Mancos Shale of Utah, New Mexico, and Arizona; Arcadia Park Formation of the Eagle Ford Group of Texas; lower part of the Carlile of the Great Plains and Black Hills; Frontier Formation of northern Utah and western and southwestern Wyoming; Colorado Shale of Montana; the Blackstone Formation of southern Alberta; and Turonian of California and Oregon. C. woollgari is found in the middle part of the European Turonian (Matsumoto, 1959, p. 108) and is also found in the zone of Terebratulina lata of the English Middle Chalk. To Western Interior beds containing C. woollgari, Reeside (1957) assigned an age of early middle Turonian. Only one other described species, Scaphites patulus, is known to be restricted to rocks of Fairport age. S. patulus has been found only in the lower part of the Carlile Shale of South Dakota, Wyoming, and Kansas; the Colorado Shale of Montana; and the upper part of the Blackstone Formation of Alberta. Apparently, it is known only from the zone of Collignoniceras woollgari. Present identification of this species is based on two specimens collected by me and especially one in The University of Kansas collections that was identified by T. Matsumoto. 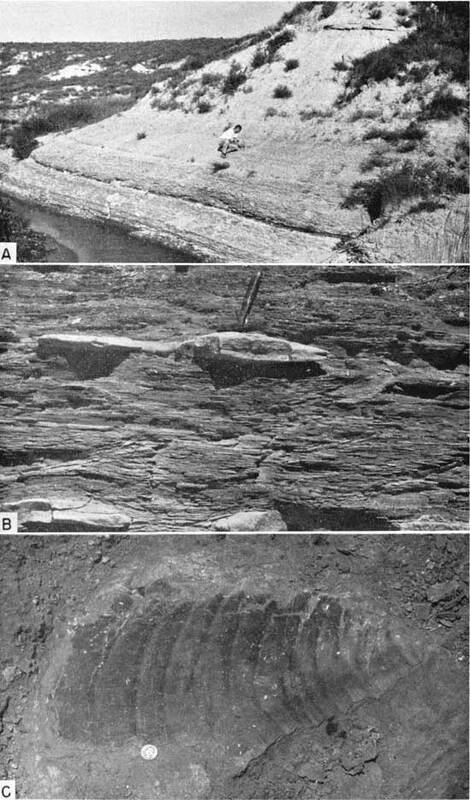 Two additional specimens from the "Blue Hill Shale" at Cedar Bluff Dam, Trego County, Kansas, were described by Matsumoto and Miller (1958, p. 355). The Cedar Bluff fossils probably should be regarded as Fairport fauna for reasons discussed above. Two additional molds of Scaphites, collected by me, cannot be identified specifically. Actinocamax manitobensis is a fairly short-ranging species that has scattered regional distribution. A single well-preserved specimen was collected from the middle part of the Fairport at locality 19. Three other specimens, described by Jeletzky (1961), and now in the collection at Fort Hays Kansas State College, are of uncertain stratigraphic horizon but are probably from the Fairport. The species is known elsewhere in the Cardium Formation of Alberta, the Tuskoola sandstones (sic) of British Columbia, and the Assiniboine Member of the Favel Formation of Manitoba and Saskatchewan (Jeletzky, 1950, 1961). The Assiniboine Member lies above the zone of Inoceramus labiatus, this species being confined to the Keld Member of the Favel (Wickenden, 1945, p. 32), and below rocks the lithology of which suggests homotaxial equivalence with the Blue Hill Shale Member. Correlation of the Fairport with at least a part of the Assiniboine thus seems logical. Other Favel species, including a large flat Inoceramus, Serpula cf. S. semicoalita, Ostrea congesta, and Stramentum canadensis, make up an assemblage similar to that occurring in the Fairport. Two short-ranged species of intercontinental distribution are Inoceramus labiatus and I. latus. The former species has nearly worldwide distribution and is characteristic of lower Turonian rocks. It occurs in the zones of Rhynchonella cuvieri and Terebratulina lata of the English Middle Chalk. Most forms in the T. lata zone are broader and less high than the typical forms (Woods, 1912, p. 13). The species is characteristic of the Greenhorn Limestone but ranges into the lower few feet of the Fairport, where typical high, narrow forms are subordinate in numbers to the broader, less high forms. A gradation stratigraphically upward is observed from I. labiatus to its descendant, I. latus, the latter being abundant in middle and upper Fairport beds and seemingly ranging also throughout the Blue Hill Member. I. latus is widespread in upper Turonian strata of Europe and is most characteristic of the zone of Holaster planus of the English Middle Chalk. Long-ranging invertebrate species in the Fairport Member include Ostrea congesta, Inoceramus cuvieri, Serpula tenuicarinata, and S. semicoalita. O. congesta, one of the commonest oysters in Cretaceous rocks of the Western Interior region, has a known geographic range that extends from Mexico northward to the southern plains provinces of Canada, and from Kansas westward to Utah. It has been reported also from Texas, Arkansas, and New Jersey. 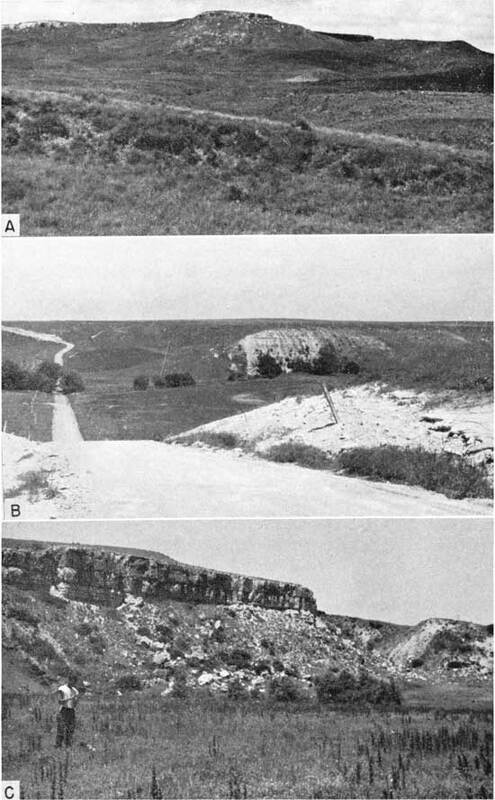 Most reported occurrences are in beds of the Fairport through the Niobrara; however, Morrow (1941, p. 129) recorded O. congesta in the Greenhorn of Kansas, Fisher and others (1960, p. 29) reported the species in the Eagle equivalent of the Mancos Shale of Utah, and Stott (1961, p. 29) recorded its occurrence in the middle part of the Wapiabi Formation of Alberta. I. cuvieri (Pl. 11C) has been reported in the Kansas Carlile by Hattin (1952, p. 45) and by Matsumoto and Miller (1958, p. 354). The species has been discovered also in the upper part of the Seabee Formation (Turonian) of Alaska by Jones and Gryc (1960). These authors stated erroneously (1960, p. 152) that the lower limit of the range of I. cuvieri in North America is the zone of Collignoniceras hyatti (Blue Hill). Stott (1961) reported Inoceramus cf. I. cuvieri in the Cardium and Wapiabi Formations of Alberta. Most Kansas specimens are from the Fairport Member or from the Fencepost bed (uppermost Greenhorn Limestone). Fragments of a large, flat, thick-shelled Inoceramus that have been reported in other areas from beds correlative with the Fairport may prove to be of this species. I. cuvieri is widespread in Europe and ranges from the zone of Terebratulina lata to that of Micraster coranguinum of the English Middle and Upper Chalk. S. tenuicarinata is known from the Fairport and Niobrara of Kansas, from the "Fort Benton Group" of South Dakota, and from the lower Carlile equivalent of the Mancos Shale of Utah. The apparent stratigraphic range of this species is Fairport through Niobrara. S. semicoalita is known only from Manitoba and Kansas. In Canada it has been collected from the Favel Formation, and in Kansas from the Fairport and Niobrara. The range of Ostrea lugubris is extended to somewhat older strata than reported previously by discovery of two specimens in the middle part of the Fairport at locality 4. [Note: Dr. Erle Kauffman, U.S. National Museum, has examined these Fairport oysters and believes that they are not O. lugubris.] The range shown by Cobban and Reeside (1952) includes the zones of Scaphites warreni and Prionocyclus wyomingensis of the middle part of the Carlile Shale, or Turner Sandy Member, equivalents. Stott (1961, fig. 2) shows the range of O. lugubris in western Canada as extending from the top of the zone of Collignoniceras woollgari upward to the base of the zone of Inoceramus deformis and Scaphites preventricosus. This range includes strata equivalent to the Blue Hill, Turner, and Sage Breaks Members of the American Carlile. Morrow (1941) described a single specimen from the Blue Hill Member in Mitchell County, Kansas, that was collected and identified by J. B. Reeside, Jr. This is, so far as I am aware, the only other specimen known from the Carlile of Kansas. O. lugubris has a geographic distribution that includes Mexico, Texas, New Mexico, Colorado, Utah, Kansas, and Alberta. Calcite-filled holes in a fossil log of the genus Cedroxylon are ascribed to the genus Teredo, wholly on the basis of size and relationship of borings to wood fragments. A single Exogyra is so contorted by attachment as to preclude adequate comparison with named species of the genus. Previously undescribed species of the bryozoans Conopeum and Proboscina and the barnacle Stramentum? will be treated fully in a separate paper. Identification of the genus Hamulus in the Fairport is based on a single cross section in a thin section of chalky limestone from locality 29. Bass (1926, p. 66) reported Baculites from the Fairport of Hamilton County, and I discovered a few molds at locality 21 that may belong to this genus. Matsumoto and Miller (1958, p. 355) reported Proplacenticeras pseudoplacenta from the spillway at Cedar Bluff Dam, Trego County (Loc. 56). If these strata are, as I believe, part of the Fairport Member, then this species also should be added to the list of Fairport invertebrates. Shark teeth are common in the Fairport and have been collected at many localities. Eight named species have been identified by me, none restricted to the Fairport Member. Five species are long ranging and of intercontinental distribution, namely: Scapanorhynchus raphiodon, Squalicorax falcatus, Isurus appendiculata, I. desorii, and I. mantelli. Pytchodus martini has been reported hitherto only from the Niobrara of Kansas. P. anonymus has been reported from the Niobrara and Benton? of Kansas. P. whipplei is known from Mexico, New Mexico, Colorado, Wyoming, South Dakota, and Kansas; the range is Fairport through Niobrara. Foraminifera of the Fairport Member of Kansas have been treated by Morrow (1934) and Griffith (1947). Three species described by Morrow and seven additional species reported by Griffith, including one previously undescribed species, are all long-ranging forms. All are calcareous. Fox (1954) listed three species from the Fairport equivalent of the unnamed member of the Carlile Shale near Belle Fourche, South Dakota, two of which were also reported from Kansas by Griffith; all three of Fox' species are long-ranging forms. Known Foraminifera of the Fairport Member of Kansas are not restricted stratigraphically and are not useful for precise correlation of these strata. Placed on web March 11, 2010; originally published May 1962.